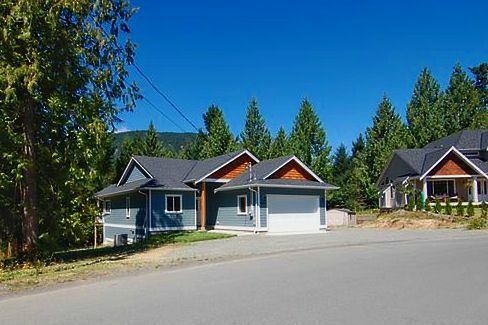 ** WOW - GREAT NEW PRICE** NOW $417,900. 1 ACRE - TIME TO BRING YOUR OFFER? Close to highway for commuting. ESSENTIALLY BRAND NEW, QUALITY BUILT main level entry home has 2,206 sq ft in total which includes a basement ready to be finished. With lots to offer on just over 1 acre in a convenient location close to Duncan, in a great subdivision of fine homes! The open living design features a living room with included 50" plasma TV, and is highlighted by the spacious kitchen with a large island, under cabinet lighting and the functional "triangle" setup for the chef in the family. The dining area opens to the rear deck, which is more than 1/2 covered and ideal for year round gatherings. The master bedroom is ample size and features a large walk-in closet and 4 piece ensuite. 2 additional bedrooms are each wired for TV. Down is a large unfinished walk out basement with roughed in plumbing and huge crawlspace awaiting your ideas. The garage is 24' deep with 10'6" ceiling offering plenty of space for the full size truck, boat or SUV, and is wired 220. The year round comfort of a heat pump, 9' ceilings on the main floor, tiled entrances, nice laminate, new appliances, RV parking, rear yard has nice size trees and lots of space to build a shop, or?... options are many...come and take a look! Text message or call me for a viewing or more info. If long distance, call collect. I'll be happy to hear from you, 250.701.1215Mike Eddy www.MikeEddyForYou.com "It's All About You!" Thanks for your business.